Published: April 2nd, 2019 by Simon. Filed in Bathroom and tagged Bathroom Basins, bathroom design, feature tiles, freestanding baths. Houzz.com.au recently released their Houzz & Home International Comparison report for Home Renovation Activity, and the report found that 52% of homeowners in Australia renovated their home in 2017. And 16% of these homeowners choose to renovate their bathroom. So, given these statistics, there is a good chance that you’ll be renovating your bathroom in the next 12 months. At Ross’s Discount Home Centre, I meet customers looking to purchase bathroom products for renovations on a daily basis. And over the years, I’ve learned the trade secrets behind designing a dream bathroom. Today, I will share some of these secrets to help you design the bathroom of your dreams. Like the kitchen, the bathroom is one of the most used rooms in a home. Because if this, functionality is the first thing you need to consider when renovating a bathroom. Start by creating a bathroom layout that will be as efficient as possible. Depending on the space available, you can choose a one-wall, two-wall or three-wall layout. 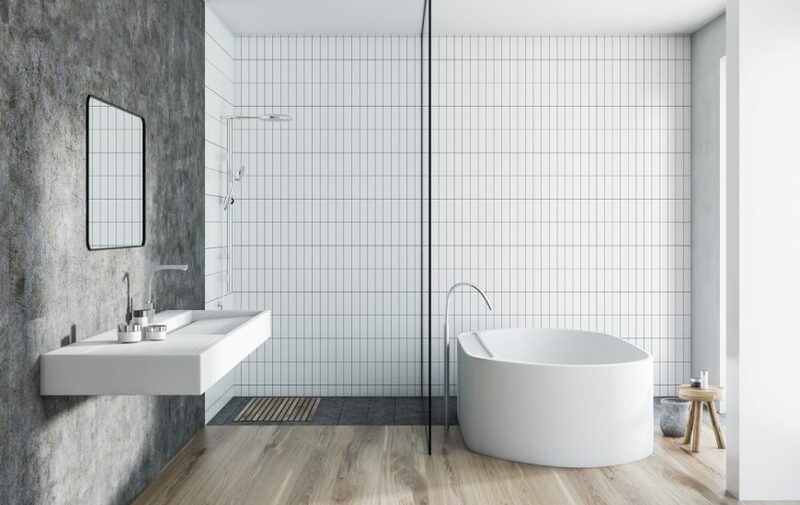 A one-wall layout – where the sink, shower, and toilet are all along a single wall – is the most cost-effective bathroom layout. However, it is also very limiting. If you have more space, you should choose either a two-wall or three-wall layout for your sink, tub, and toilet. These layouts will make your space much more functional and usable. Not only is the basin an extremely important part of any bathroom, but choosing the correct basin can also help define the look of a bathroom. Today, bathroom basins are available in a range of styles and designs, ranging from top-mounted basin to under-mounted basin and vessel basin. While vessel basins are the most affordable and easiest to install, they may collect grime. Top-mounted and under-mounted basins are much easier to clean and maintain. Depending on the vanity you choose, get a top-mounted or under-mounted basin accordingly. You’ll find a full range of affordable bathroom basins in Perth with us at Ross’s Discount Home Centre. While you can certainly design a gorgeous shower or bath, nothing will make your bathroom look as grand and luxurious as a freestanding bath. A freestanding bath exudes luxury and can help you to create a spa-like experience in your bathroom. Depending on the style of a freestanding bath and the space available in your bathroom, you can get creative with your designs. Here, at Ross’s Discount Home Centre, we offer an extensive selection of freestanding baths in Perth. Consider our Bermuda Freestanding Bath if you’re looking for something on the contemporary side. On the other hand, if you’re looking for a classic freestanding bath, our Elisabeth Clawfoot Bath is a perfect choice. Feature tiles are a must! To give your bathroom that extra ‘wow-factor’, adding feature tiles to your bathroom floors and/or walls is a must! While you can choose to create a seamless look by using the same tiles all over, you can also contrast tiles to create an interesting effect in your space. For the biggest selection of floor and wall feature tiles in Perth, look no further than us here at Ross’s Discount Home Centre. Regardless of what style you’re looking for, you’re sure to find the perfect feature tile from our extensive range. There are several trade secrets you can do include your bathroom renovation to ensure that you design the bathroom of your dreams. Always consider the functionality of your space before you start with your renovations. Make sure to keep the layout of your bathroom as efficient as possible. Choose your bathroom basin carefully and consider including a freestanding bath in your space. Lastly, add a feature tile to your bathroom floors and/or walls to give your space the extra ‘wow-factor’. For everything you need to design the bathroom of your dreams, visit us at Ross’s Discount Home Centre. We offer everything you could need, ranging from tiles to bathroom vanities, toilet suites and tapware to bathroom accessories, baths, shower screens, vanity tops, bathroom basins, and cabinets. Drop by our showroom in Guildford or shop from our online store today! Get 5 designer bathroom looks for less! These stunning freestanding bath mixers will make your bathroom! Lakes Bathrooms makes bath screens fashionable once more!